Time is a precious resource for everyone, especially busy employees, managers and CEOs. Time management can be tricky and it is often hard to find the perfect balance between tasks and knowing what to prioritise. We've decided to try and help make things a little easier by gathering twelve time management tips used by successful CEOs that you can put into effect immediately. Keep reading to find out what they are! Apple co-founder Steve Jobs believed “innovation is saying no to 1,000 things”. As a manager or CEO, you’re going to get dozens of emails, phone calls and people approaching you for help, conversation or advice. This is especially true if you’re an entrepreneur whose new business is doing well. You are well within your rights to say no to offers that you see no benefit to accepting. Simply explain politely that you are busy and at this moment in time you will be unable to help or assist them. Managers and CEOs spend a large chunk of their time reading and replying to emails which sometimes becomes an overwhelming drain of time. To take back control of your emails you need to get organised. One way to do it is to create folders based on priority, or project, and flag emails that need attention. Microsoft founder Bill Gates uses this exact tactic to manage his emails. You could also deal with your emails in batches, such as once every two hours, as this helps make them more manageable. Tony Hsieh, CEO of Zappos, swears by dealing with yesterday’s emails today so that you have a set number of emails you need to respond to by the time the day is over, instead of new emails popping up every five minutes and cluttering your vision. He calls this strategy ‘Yesterbox’. There are plenty of programs available out there that can help you achieve inbox zero. One of these is Boomerang which makes emails re-enter your inbox as new emails at a designated time so they get the needed attention. SaneBox helps streamline your inbox by moving any emails that do not need your attention, like bulk emails sent to all staff about miscellaneous topics, to a dedicated folder. "Take care of the minutes and the hours will take care of themselves." One easy time management tactic that can be applied in both your personal and professional life is the two-minute rule. This rule states that if it can be done in two minutes, then just do it now. Uber use this strategy to allow for easy and time-effective roll-outs in new cities where they’re making Uber available. This is one reason why they have scaled so quickly and effectively. They created a playbook of everything that needs to be done for a successful launch in a new market so that it can be followed across the world. You can apply this tactic as a manager by creating playbooks for time-consuming tasks that you deal with regularly, so that you are able to delegate them without worrying they won’t be done to the same standard. The 80/20 rule, otherwise known as the Pareto Principle, states that to achieve peak efficiency, your tasks and management should be done at a ratio of 80:20. There are two ways you can apply this to your work. The first is by dedicating 80% of your time to things that truly matter at work, like business development or product innovation, and 20% of your time can be spent on smaller things. The second is by focusing your attention on the most important 20% of tasks that you know are important and by delegating the other 80% of tasks. "Those who make the worse use of their time are the first to complain of its shortness." Katia Beauchamp, co-founder of Birchbox, gets all her employees to put a response time at the end of every email they send her, no matter how short the query or message may be. This allows her to prioritise her tasks effectively and understand what needs her focus and attention at a glance. If you’re the kind of manager who likes to be on top of everything, then having your notifications and emails accessible on-the-go is a must. Our CEO Kristian is always wearing his Apple Watch so even when he is away from his phone or computer he is aware of incoming calls, emails and Slack messages. This helps him stay in-the-know and available. You can also use your smart watch to send you reminders about certain tasks so you are never behind. Jeff Weiner, CEO of LinkedIn, strongly believes that having time to think is important. He says that "part of the key to time management is carving out time to think, as opposed to constantly reacting”. Avoiding reacting too quickly also allows for better management decisions to be taken, and gives you vital time to consider other possibilities and solutions. Steve Ballmer, Ex-CEO of Microsoft, creates a ‘budget’ to manage his time. He has a spreadsheet that his assistants have access to, where time is assigned in his budget to those who need to meet or speak with him. This helps him manage his time and make sure he isn’t spending too much time on unnecessary things. Ex-US President and US Army General Dwight Eisenhower was an expert in time management. 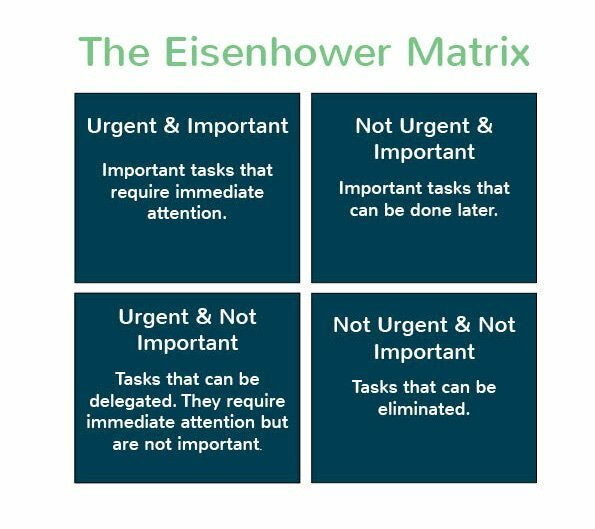 He is the namesake of the Eisenhower Matrix, a time-management solution. The matrix is based on his belief that “most things which are urgent are not important, and most things which are important are not urgent”. To complete the matrix, you need to allocate tasks based on their urgency and importance. You then prioritise the tasks which have been characterised as having high urgency and importance. You postpone tasks that have low scores on both. Categorising your days is a helpful way to stay focused on tasks and make sure your time is being well spent. Jack Dorsey, co-founder and CEO of Twitter and Square, gives each day a theme. He does this so that he is able to manage both of his businesses, without tasks from each overflowing into each other. Another way to split your days is to have ‘focus days’ and ‘buffer days’. On your focus days, you may stay away from your emails and social media and instead focus on getting high-priority tasks done, and on your buffer days you can dedicate time to having open office hours or responding to low-priority tasks and emails. Meetings can often be the number source of wasted time for managers and CEOs. I’m sure every manager knows the feeling of sitting in a meeting and thinking to themselves “this could have been sorted via email”. Adora Cheung, CEO of Homejoy, tackles this by creating strict meeting agendas. She sends round a Google Doc before the meeting where participants write down topics that they want to be discussed. Adora then prioritises these topics, and if it’s not on the list then it’s not being discussed. Writing a report is one of the worst tasks that every manager or CEO has to do. Writing a report is time-consuming and mundane and it becomes repetitive and boring when you have to do it every single month or quarter. This is where Plecto comes in and saves you a heap of time and energy. By using a dashboard to visualise your KPIs and results, you can save yourself the trouble of having to write a written report every month. Instead of reporting your figures in a writing, show those concerned a dashboard. Easy! Our dashboards can also display historical data so anyone with access can view development over time and easily monitor business progress. You could create a dashboard for each department and also one dedicated to your CEO/board with all the figures they want and need to see. Interested in saving a ton of time by visualising your data on dashboards? Start a 14-day free trial of Plecto. Just enter your email address below to get started. Want to learn about being a good manager?